The upcoming new Ducati Multistrada 1260 Enduro, which replaces the Multistrada 1200 Enduro, is on display at the ongoing Thai Motor Expo in Thailand. 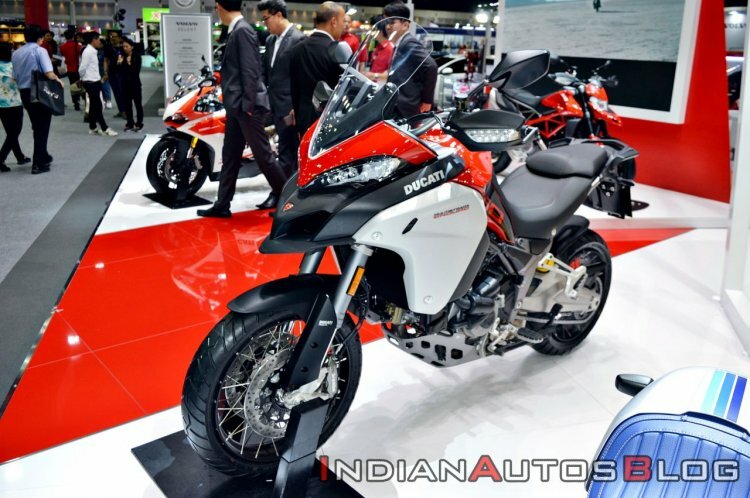 The new Multistrada 1260 Enduro is expected to arrive on Indian shores in 2019 to compete against the likes of BMW R1200 GS and the Triumph Tiger 1200 in the Indian market. The Enduro badge model received a massive overhaul to make it off-road ready. The 1260 Enduro uses spoked wheels in 19” at the front and 17” at the rear. First introduced in 2016, the Multistrada 1200 Enduro was Ducati's first travel enduro and was based on the Multistrada 1200. However, it wasn’t just a wheel upgrade. The Enduro badge model received an overhaul to make it off-road ready. 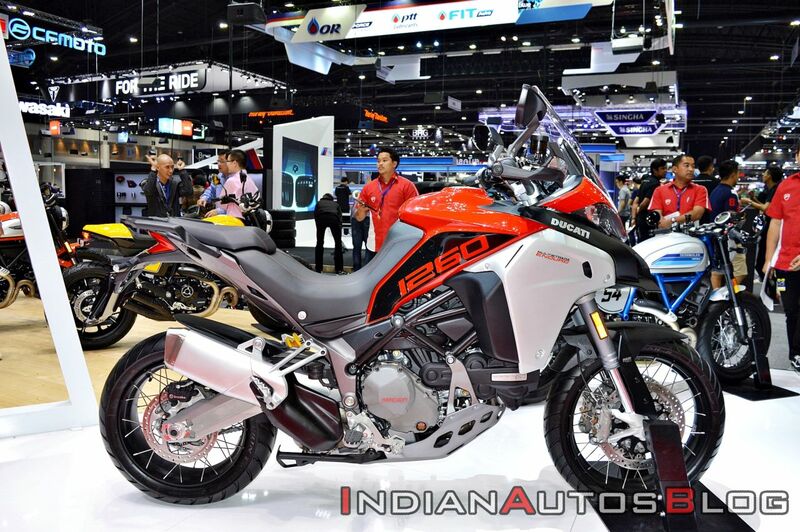 Now, along with the road-focused Multistrada, the Enduro too has received an upgrade. The new 1260 Enduro is designed to be more user-friendly and fun. Compared to its predecessor, the seat, handlebar and centre of gravity are lower on the 1260 Enduro. Similar to the 1200 Enduro, the 1260 Enduro continues to use spoked wheels in 19” at the front and 17” at the rear combination. Shock absorption duties are performed by recalibrated electronic semi-active Sachs suspension (with 185 mm of travel both front and rear) while a 30-litre fuel tank ensures a long range between refills. Ducati claims that the Enduro has a range of 450 km on a full tank of fuel. Mechanical specifications include a 1262cc, Ducati Testastretta DVT with Desmodromic Variable Timing, L-Twin cylinder, 4 valves, Dual Spark, liquid cooled engine that delivers 158.3 bhp of power at 9,500 rpm and 128 Nm of peak torque at 7,500 rpm. The engine is paired with a six-speed transmission with Ducati Quick Shift (DQS) for clutchless up/down shifts. Standard electronics package includes Bosch Cornering ABS, Cornering Lights, Wheelie Control, Traction Control and Vehicle Hold Control, making this bike the segment benchmark. The new Multistrada 1260 Enduro will be available in Ducati Red and Sand. The 5" TFT colour display continues to use Ducati Multimedia System (DMS) to connect the bike to the rider's smartphone via Bluetooth, giving access to all key multimedia functions (incoming calls, text messaging, music). Other Multistrada 1260 Enduro features include cruise control and a hands-free system. The 5" TFT colour display continues to use Ducati Multimedia System (DMS) to connect the bike to the rider's smartphone via Bluetooth. The new Ducati Link App lets riders set the journey mode (a combination of Load and Riding Mode) and personalise the parameters of each Riding Mode (ABS, Ducati Traction Control, etc.) via their smartphones. Furthermore, the Ducati Link App lets riders record performance and routes so they can share their Enduro 1260 riding experiences. Optional accessories include aluminium panniers and top case, and the Touring, Sport, Urban and Enduro packages.